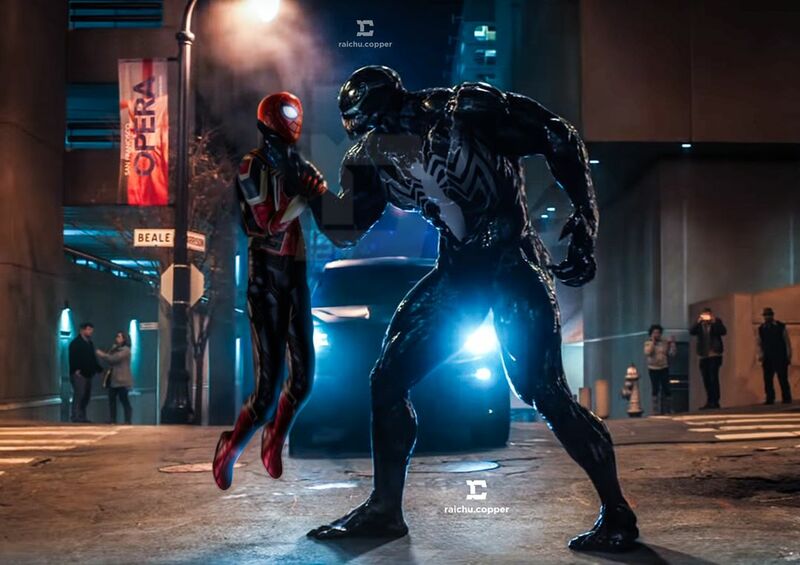 After an insanely strong showing at San Diego Comic-Con last month – which saw the sinister symbiote feature drop a brand spanking new teaser, and reveal the secret identity of genius inventor Carlton Drake – laid the groundwork, it would appear all that’s left for Ruben Fleischer’s Venom to do is open, which it will soon enough, on October 5th later this year. Before you go purchasing your ticket, though, we’ve got a delectable piece of fan art depicting the cantankerous Klyntar locked in battle with your friendly neighborhood Spider-Man that you simply must check out. After all, Tom Hardy did have a choice word or two for the portrayer of the titular web-head, Tom Holland, last month, and seeing as such a showdown as even been tease by Fleischer himself, it might just become a reality one day. Considering the size difference here, and Venom’s ability to literally bite someone’s head off, I’m going to have to give the edge to my man Eddie Brock. I mean, don’t get me wrong, I thoroughly enjoyed Spider-Man: Homecoming and I’m really looking forward to Far From Home, especially now that Jake Gyllenhaal has come aboard, but truthfully speaking, in a no holds barred street fight – and not inside the wonderful world of Disney, which is crucial – Venom comes out on top ten times out of ten. Thankfully, we’ll know what Ruben Fleischer and company have in store for us shortly. As I said earlier, Venom is scheduled for release on October 5th later this year, and barring any unforeseen disaster – which, apparently to some, does seem like a foregone conclusion – Sony and Disney have plenty more of the sinister symbiote lined up. Or at least, that’s according to the director himself. And who knows, maybe we’ll eventually get to see Holland vs. Hardy at some point? Fingers crossed!